Ready for family movie night? 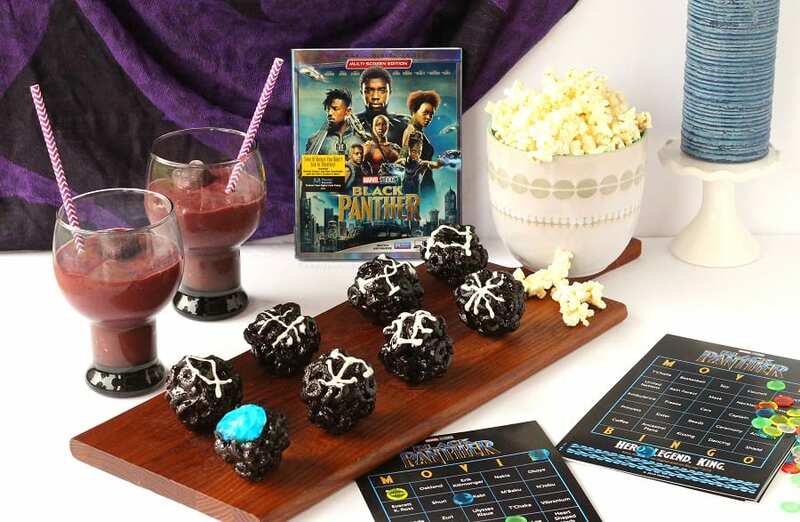 Grab your Black Panther Party Ideas + FREE Printable game to celebrate the newest Marvel Blu-Ray release. This post is sponsored by Marvel Studios. All super hero inspired opinions are my own. May contain commissioned links. Who’s ready for a Black Panther family movie night? It’s finally time to bring home Wakanda forever with Black Panther on Blu-Ray available on Tuesday May 15th, and Black Panther on digital now. 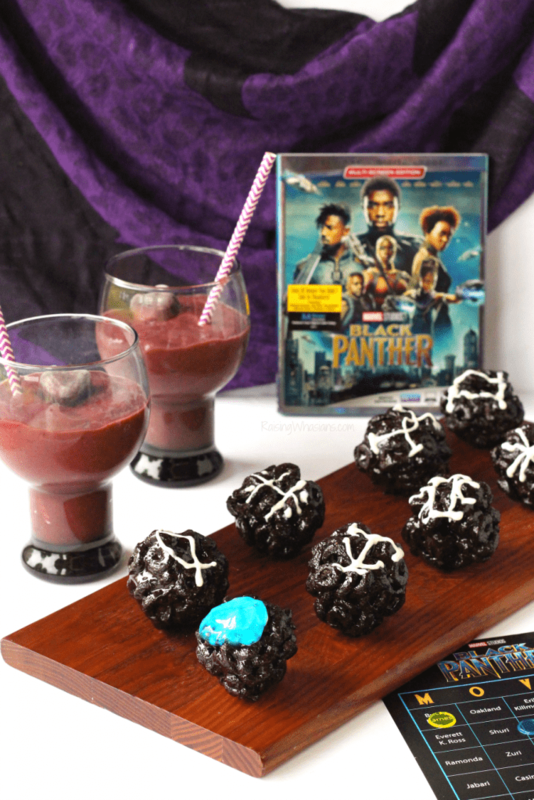 Celebrate this historic Marvel film with lots of Black Panther Party Ideas – perfect for a birthday, movie night or just because we heart T’Challa and Wakanda so much. Be sure to scroll down for a movie giveaway too! I don’t know about you, but the thought of owning Wakanda forever is pretty darn cool. With this historic and record-breaking Marvel film, Black Panther was high on my re-watch list. (Check out this Black Panther movie review to see if it’s safe for your kids to see.) Available on Digital and Blu-Ray, now your family can own a piece of Marvel history. Love movie bonus features? Me too! When your bring home Wakanda Forever you get all of the behind-the-scenes goodness of Black Panther. My best tip? 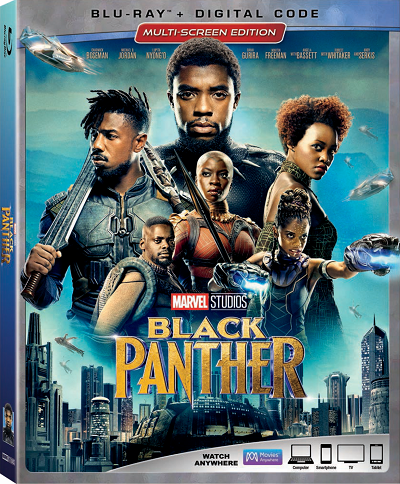 Watch the Blu-Ray with the subtitles to understand what the Wakandans are saying to each other. Can we talk about the gag reel? Want super human Black Panther strength? 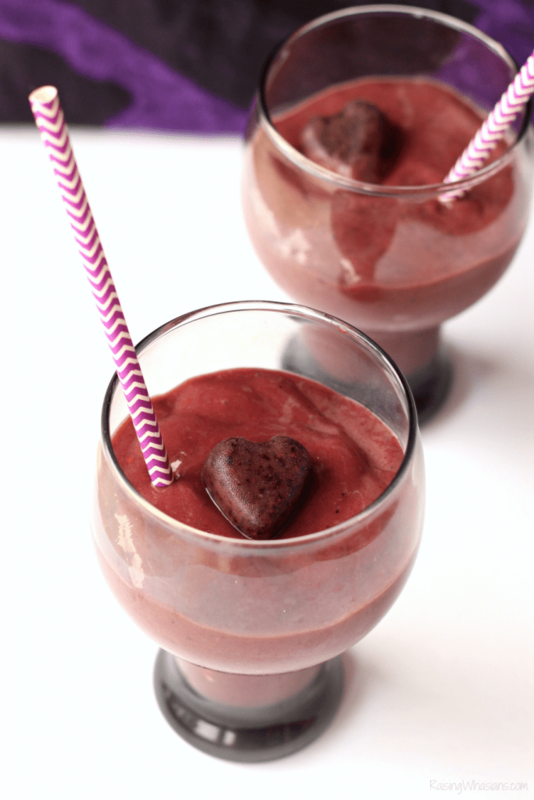 Tell your kids to drink up their Heart-Shaped Herb Black Panther smoothie! Chock full of fresh fruit and sweet goodness, your kids will love this healthy take on this magical Black Panther drink. Blend fresh blueberries. Pour into heart shaped ice cube tray/mold. Freeze for 2-4 hours or until firm. Blend blackberries, mango, banana together until liquefied. Add and blend ice cubes as needed. Top with 1 frozen blueberry heart-shaped herb. Serve immediately. Makes about 3-4 smoothies. Wakanda inspired food, anyone? 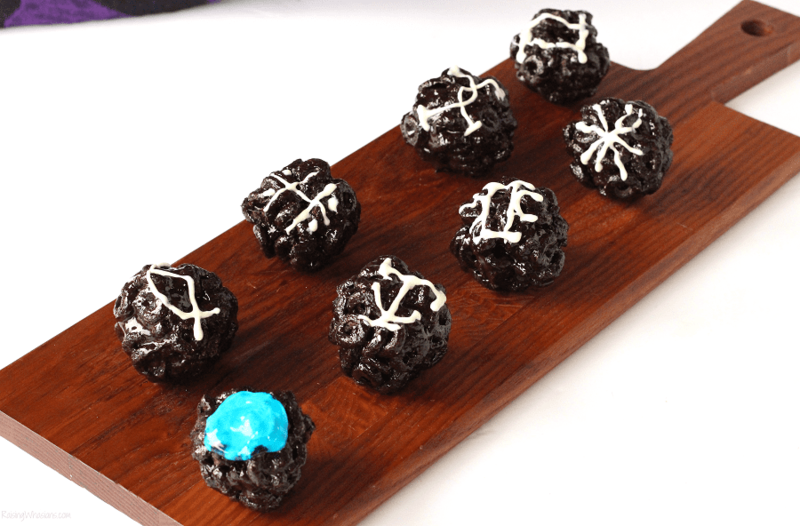 Make twist on the traditional crispy treats recipe to make this treat Black Panther approved. SO FUN! Just add black food coloring as you melt your marshmallows and switch out crisped rice cereal for a chocolate-y cereal (we used new Oreo O’s). Form into spheres. Cool. Decorate with white writing icing and blue food gel. 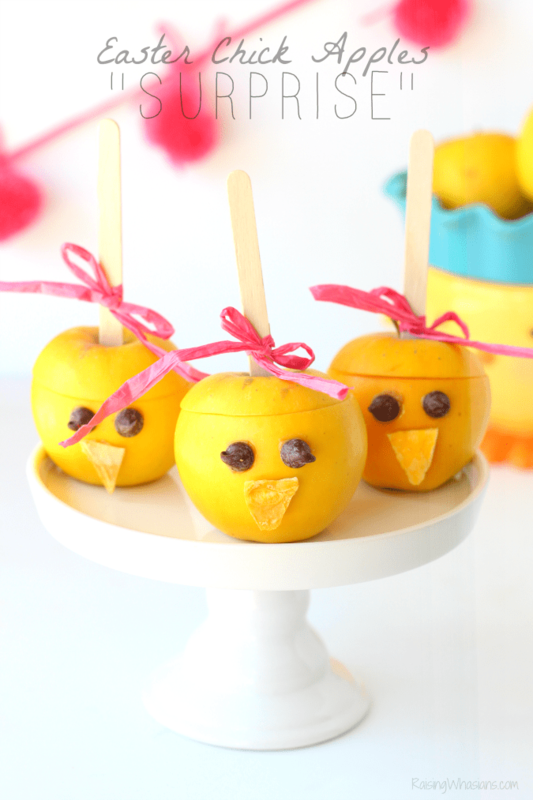 Want to make family movie night even more fun? 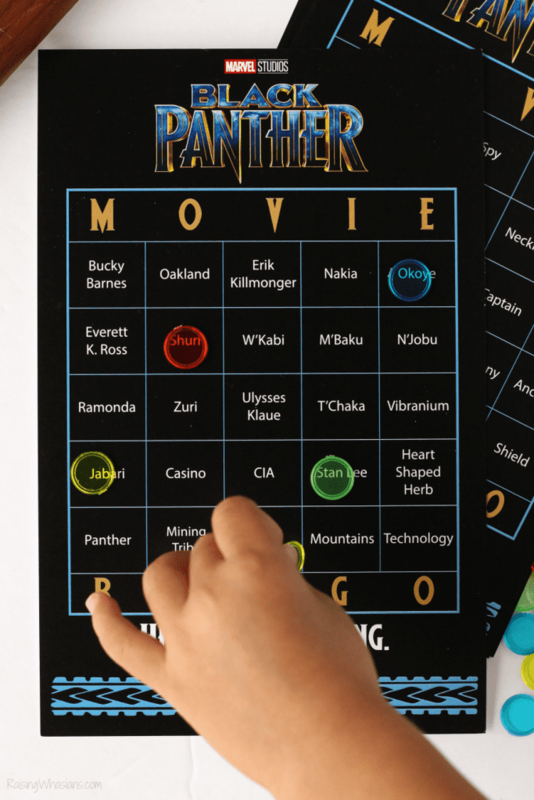 Grab your FREE Black Panther Game Printable. This 12-page printable is a quick and fun way to add some extra game time to your movie night. Play Bingo together while you watch the film. Our family LOVES Black Panther. From the diversity and culture to the action and story, there’s so much to love about Wakanda. Hope your family enjoys these Black Panther Party Ideas as we gear up for another amazing super hero movie release. Disclosure: This giveaway is sponsored by Marvel Studios. Raising Whasians is responsible for prize fulfillment. One winner will be randomly selected using the Rafflecopter random selector and will be notified via email. Once notified, the winner will have 24 hours to respond or a new winner will be chosen. This giveaway is in no way associated with Facebook, Twitter, Instagram, Pinterest or Google. Void where prohibited. This disclosure is made in accordance with the FTC 10 CFR, Part 255 Guides Concerning the Use of Endorsements. Be sure to follow Raising Whasians via Facebook, Twitter, Google, Instagram, Pinterest and YouTube for more of your favorite giveaways! I liked that this movie added more female super heroes, plus I loved the scenery. I want to see this movie they say it is good. My boys and husband have been wanting to see this so bad! We loved this movie. It has everything action, stars and good fun. Alysia loves it, she is 8 years old. I love the action, the story and the actors. I love its SuperDiversity. I’d like to watch it with my bestie Steps. I love the positivity and strong female roles in this movie. I haven’t seen the movie yet, but have heard great things and love the marvel series! I have heard that this movie is very good for a super hero movie. I will have to watch it someday soon. I love that it is empowering a Black hero as a positive role model. I’m taking my kidlet, who is mixed. I love that this is a Marvel movie since everyone in my family is a huge Disney/Marvel fan! I will definitely be watching this with my husband and two sons, who can’t wait to see this film! I loved the movie Black Panther for the scenes set in Wakanda. I liked the technology of the city. Thanks for hosting the giveaway. I don’t know much about it, but my kids all want to see it. I haven’t watched it yet, but I’m looking forward to watching it with my son. I like the strong characters. I would watch with my husband and kids. I can’t wait to have family movie night & watch this movie!! The most diverse cast in the MCU. All the characters were fully realized and brought to live on the big screen! I would watch this movie with my family! I’d like to watch this with my husband on a night-in movie date! I can’t wait to watch this again! My husband and I saw infinity wars separate since babies… so I would watch it with him ! Maybe the best villain in any Marvel movie so far. I love that it brought to the lead role a black superhero. I’d like to watch the movie with my son. I’d love to watch this with my kids. I like all the action scenes and would like to watch with my family. This is such a great escape into action and adventure!! I would watch this with my 12, 15 and 18 yr old. I love that the story would still be good without superheroes in it! My husband can’t wait to watch this again! Wakanda forever. I’d watch this with my daughter. I thought that part of the movie felt like a spy film. Also, I thought his little sister was really funny. I saw it at the movie theater with my wife. She liked it. I think she’d watch it again with me. i love that the women are the guards of the black panther, it’s a great movie. I’d watch with my family. They like superhero movies. We love this movie. I would watch it with my boyfriend. I love that it’s a completely new story. I would watch this with my husband. i loved a lot of the social implications of the film. Well acted and directed. I will watch it with my daughter. Haven’t seen it yet but I know my boys will love it! I loved the message and powerful women who were warriors protecting Wakanda. I just saw it this weekend with my family for the first time. It was a good movie. I love Shuri and I would watch this with my little girl! I love Marvel super hero movies. I like that it gives another view of Black heroes. I would watch it with my grandchild. I havent got to see it but I want to watch it with my son. I know that he would love it I caught him watching the trailer videos. I like the technology in this movie and I would watch it with my family. I have not seen the movie yet and I would like to see if with my son! The treats you made look so yummy!! I would have never thought to use black food coloring on anything LOL.